AIABaltimore has recognized Ziger/Snead Architects’ design for the Baltimore Design School with the Good Design = Good Business Award, the Michael F. Trostel FAIA Award for Excellence in a Historic Preservation, an Excellence in Design Award in K-12 Schools, and the Grand Design Award for 2014. The Good Design is Good Business Award honors architects and clients who best utilize good design to achieve important outcomes for organizations. This award is intended to recognize projects where design excellence elevated the resulting benefit of a project to the business, institution, or community which it serves. In particular, it awards exceptional collaboration.
" The Baltimore Design School’s historic building rehabilitation brings new life to the surrounding community. The educational process is holistically embedded in the building itself, and the building inspires new creativity while retaining its original structure and memory." The Good Design = Good Business award is determined by members of the local architecture and business community. The 2014 jury included Katie Hearn of Redgate Real Estate Advisors, Baltimore journalist Ed Gunts, and design educator Mike Ryan of Anne Arundel Community College. The Michael F. Trostel FAIA Award recognizes exemplary historic preservation standards in restoration, rehabilitation, adaptive reuse, addition, and sensitive new construction in a historic environment. "The jury appreciated the sensitive reuse of the historic windows, leveraging them into an overall graphic identity of the new user. We also enjoyed the playful way that important elements of the building's original industrial functions were incorporated into outdoor teaching spaces, rather than removing those elements for aesthetic reasons. The beauty of the historic architecture was kept and celebrated." The Grand Design Award is given to a built project judged to be exceptional. "Beginning with good bones of an existing building, this design exhibits a light touch with excellent editing and restraint, yet just enough of a sense of humor. Color and natural light are utilized extremely well. The jury loved the stairwell, and the water tower. Overall, this is a stellar example of thoughtful design not only preserving an existing building, but also transforming it into a compelling and striking amenity for its occupants and neighbors." AIABaltimore is a Maryland chapter of the American Institute of Architects. AIABaltimore offers education, government advocacy, community redevelopment, and public outreach to support the architecture profession and building industry. 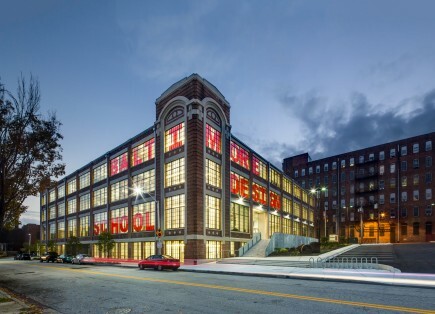 Baltimore Design School is a new Baltimore City Public combined middle and high school with a focus on Fashion Design, Architectural Design, and Graphic Design. The school is the first purpose-built public school in Baltimore City in decades and aims to be a national model for design education.